If I have Gustaf Johansen and two other Cultists in play and active the Plague Stone, would I still get the card draw(s) from Gustaf's effect? 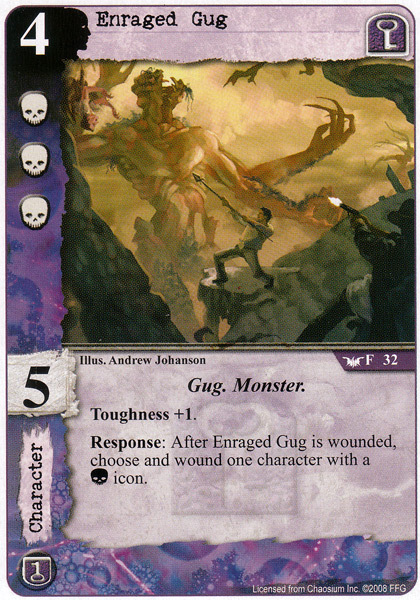 Basically, it said that you cannot trigger the Gug's Response after he receives the wound that destroys him because at that point he's already in the discard pile and thus out of play. The only exception are effects that specifically state they are triggered when entering the discard pile (or can be triggered from the discard pile). No, because the action from Plague Stone has to resolve completely before you can trigger responses. By that time, Gustaf is no longer in play so his response cannot trigger. If the Plague Stone is used, the controling player decides the order how the characters leave play. if Gustav isn't chosen as the first character, he can trigger his Forced Response (triggered by another character leaving play). So he can trigger his effect. Or am I missing something? Was he erratad to just a Response? The order of the characters leaving play doesn't matter because at the time the (Forced) Response window opens, all of them are already in the discard pile, hence you can no longer trigger Gustaf's ability.